Natural disasters are happening everywhere. Earthquakes, hurricanes, and man-made perils have left communities anxious and confused about their own emergency preparedness. 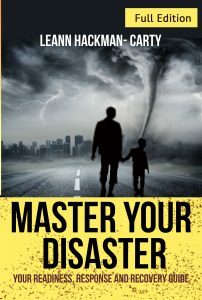 In this unique guide, preparedness and recovery expert Leann Hackman-Carty shows you how to prepare your family, business, and community for a number of devastating scenarios. Gleaned from years of experience with disaster recovery organizations, her specialized insight will help you understand the different levels of disaster preparation and recovery. •	stop a natural disaster from catching you off guard. No one knows what tomorrow holds, but Hackman-Carty’s advice can help you prepare for the worst. Master Your Disaster gives you the confidence to act calmly and efficiently when the time comes. Your new foundation in emergency preparedness, response, and recovery will make the chaos more controllable—and survivable. Disasters don’t have to destroy lives, businesses, and communities. I wrote this book because I know there are things we can do to lessen the impact. We CAN do better. As global citizens, we all need to be more prepared. It could mean the difference between saving our life, keeping our livelihood, and maintaining our quality of life. Governments, emergency response organizations, and humanitarian relief agencies cannot do it alone. We must act now.